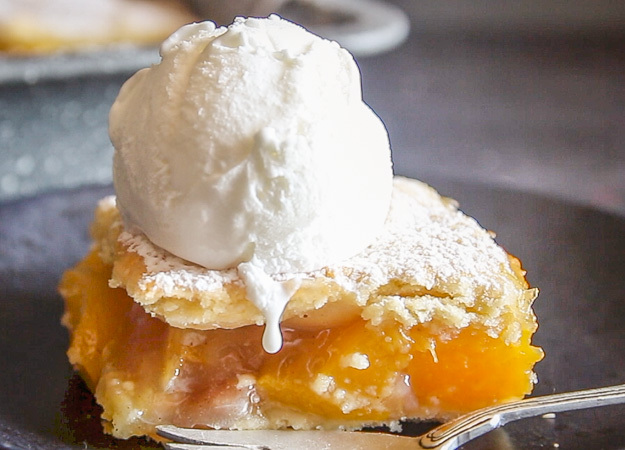 Peach Filled Italian Crostata Bars made with a tasty filling using fresh or canned Peaches. They make the perfect snack or even a perfect dessert, top them with a scoop of Vanilla Ice Cream to make them extra special. Remember I said I was going to give you a perfect dessert to go with that delicious No Churn Vanilla Ice Cream? Well this is it. If there are two fruits in the world that go really well together with Vanilla Ice Cream they have got to be Apples and Peaches. Don’t you agree? My love of a Crostata started out strong and it has continued. 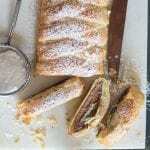 I love this Italian Pastry, I use it even to make a North American Pie, it is rich and buttery and perfect filled with fruit or even used for Cut-Out Cookies. Every Italian woman has her own Pastry Dough (Pasta Frolla) that has usually been passed down from mother to daughter, although there isn’t that much of difference between one dough and another. I have found some to be flakier or even more of a cookie base than others. This recipe was given to me by a good friend’s mother and it is the only one I use and have been using for years. It is enough dough for a 2 pie crust and a little left over (depending on the size of your pie plate) for a few Cookies. And who doesn’t love a few cookies? 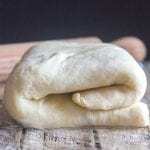 Remove the dough from the fridge and it’s ready to be rolled out and filled. 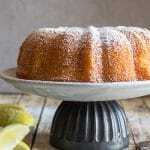 Place the first layer on the prepared cake pan then spread a couple of tablespoons of Peach Jam on top. Then top the dough with the Sliced Peach Mixture. Cover the peach mixture with the second layer of dough. This lets the steam escape while baking, that way your dough doesn’t become soggy. Nothing worse than soggy dough! Bake in a pre-heated oven for about 30 minutes. 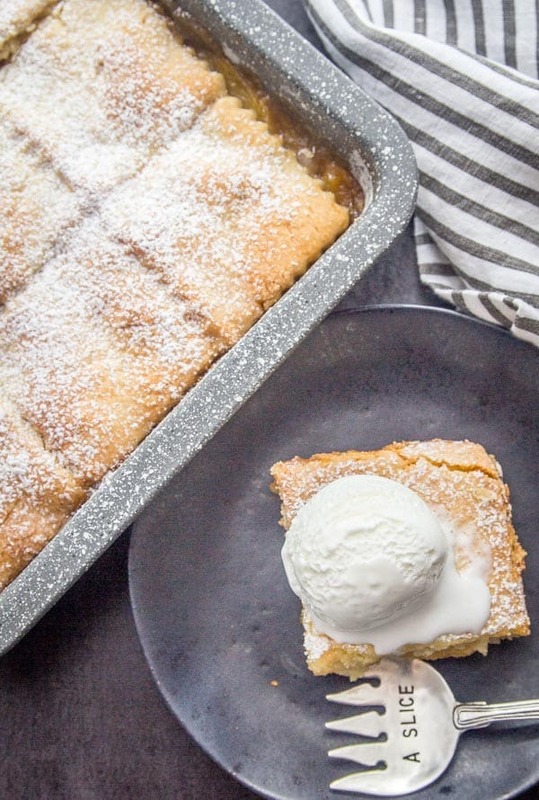 These Fresh Peach Bars are delicious either served plain or I love to serve it with a scoop or two of ice cream for dessert. Dessert is served. Enjoy! 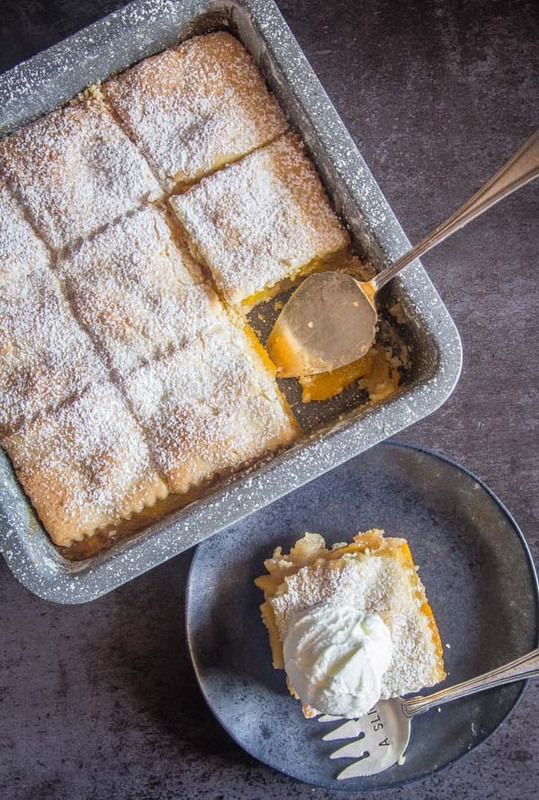 Italian Crostata Bars, a delicious Pie Bar Recipe Idea, a tasty peach filling make these rustic Italian Pastry Bars the best. Pre-heat oven to 350° (180° celsius), lightly grease and flour an 8 inch (20 centimetesquare cake pan. In a medium bowl mix together, sliced peaches, cinnamon,vanilla,lemon juice, flour and sugar, gently combine. Remove dough from fridge, roll out half the dough to fit into pre-pared cake pan, spread with peach jam, cover with sliced peach mixture. Roll out other half of dough and fit to cover the peaches, using a sharp knife remove excess dough, (use extra dough to make cut out cookies), cut 3 2-3 inch cuts on the top of dough using the sharp end of a knife. Brush top of dough with a little milk and sprinkle with sugar, bake for approximately 30 minutes or until golden. Let cool or eat warm, cut into squares and serve with Vanilla Ice Cream if desired. Enjoy! Updated from June 23, 2017. I’m not a fan of peaches but these look so good! Thanks so much, I’m sure apples would work too. Have a great weekend. I’ve been reading your blog for a while now, and it’s so great! 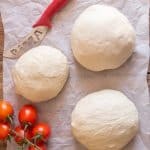 I’m married to an Italian from Marche, though we both now live in the UK we still live primarily on Italian food with the occasional roast dinner thrown in, so far he’s loved everything that I have prepared from your blog and though I have quite a repertoire myself one definitely needs some variety! These bars look amazing and I 100% just went and made them because I love all things peaches. Ugh the fresh peaches from his uncles garden in the Marche countryside are just divine. 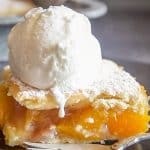 Combining peaches with crostata? My other favourite thing? Genius! So good! 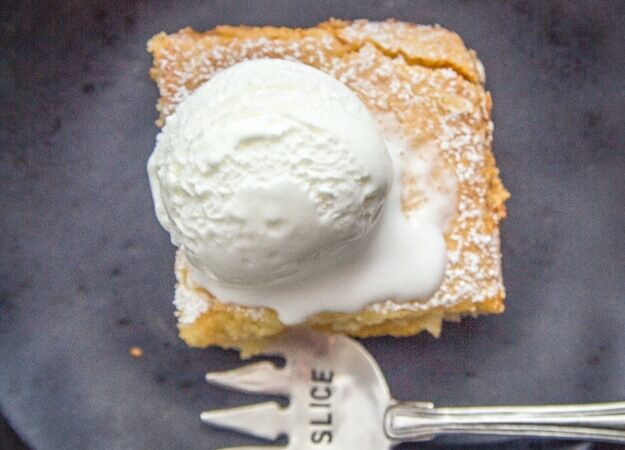 The only switch out I made was to replace the baking powder with lievito per dolci that we picked up on our last trip home, I find that the slight hint of vanilla makes the crostata taste just so… right. Where I come from in Massachusetts old Yankees always ate pie for breakfast in addition to eating it for dessert. I don’t know if it’s just a New Englandvthing or not. This recipe sounds and looks delicious. Thank you. Hi Elaine, thank you! I could sure go for pie for breakfast and I love hearing the different ways and how things are done everywhere, thanks for sharing. Have a great day. This looks so delicious! I’m pinning it for peach season. Where I live in Italy (Tuscany) people seem to eat crostata for breakfast. I’m somewhat new here so I could be wrong lol! And I know how extremely regional these things can be… Would this be served with the ice cream as a dessert after dinner? I don’t want my Italian friends to think I’m confused 🙂 I mean, it’s basically pie, right? Thanks for the recipe! Hi thanks so much, and haha yes Italians have been known to have a slice of crostata for breakfast and of course in the afternoon with an espresso. I think you could serve these squares with some ice cream, great combination and welcome to Italy. An hour ago, my mother phoned saying peaches are ripe and waiting for me….. what I usually do is a jam; now this is perfect timing: baking it tomorrow ! Thank you so much ! These sound (and look) amazingly delicious, Rosemary! I love peach anything so am adding these to the list of things to bake this summer! Thanks Olivia, hope you enjoy it. Let me know. Oh my!! The very possibilities are endless. I can even see the crostata with berries. Thank you for sharing — it looks amazing and I LOVE no-churn ice cream. Summer is almost here and I have the feeling there will be lots of ice cream. Hi Marisa, thanks, ah yes with a Crostata the possibilities are endless. Have a great week. Definitely making these bars next time I have company. You just come up with the most delicious recipes. Thank you. Hi Ann, thanks so much, hope you enjoy them. Have a great week. Thanks Pamela, they are really good.